← Anyone that likes a book with a dog in the storyline, this is your book!! 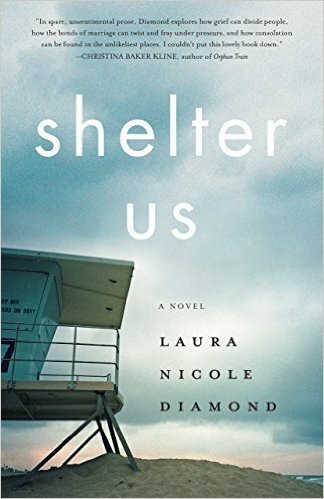 June’s Book Club Read ~ “Shelter Us” by Laura Nicole Diamond is Touchingly Brilliant!! Touchingly Brilliant!! I absolutely devoured this book!! You know that means it is amazing! No review I could write would do this story justice. Few stories touch me in this way. So, I will do the best I can…. Laura Nicole Diamond writes a truly evocative story. Her words are so brilliantly weaved together, making this a gift for me to read. I was enamored by each sentence. Some people are meant to write, and Laura Nicole Diamond is definitely one of those writers. “Shelter Us” is a story that will stay with you. There are some things you will never look at the same, and things you will think about that may have once seemed “invisible”. I felt such empathy for Sarah, because her daughter, Ella had passed away after only being alive for a mere six weeks. Ella was found in her crib asphyxiated by her sheet, and Sarah believes she is to blame and cannot forgive herself. Ella has been dead for three years, and the grief is still so strong that it is literally taking all of the joy out of Sarah’s life. Sarah feels that her husband, Robert is getting along just fine. He goes to work, takes care of the family, and he is an amazing father to their sons Oliver and Izzy. Sarah is barely getting by and cannot fathom how Robert is managing so well. I respected how both Sarah and Robert would both drop everything for their children. Even if they were in the middle of a crisis, the boys came first. They made sure that they did not need for anything. Maybe they were trying to make peace with losing Ella, by being “perfectly present parents” to Oliver and Izzy. They had a lot of making up to do. Sarah is barely getting through each day and beyond distraught about so many things. Her marriage is crumbling without either noticing. An odd silence is building between them and it is certainly waning on their marriage. Their relationship seems to be running on autopilot, and a lot of things go awry. Secrets are kept, feelings are not discussed, and they are both dissolving. She just tries to push through each step of her day, finally to go to bed thinking that “We have made it through another day”. I must admit that I was exhausted just reading about how difficult simple everyday tasks were for her, I often felt like she was trying to get out of quicksand. You know a story is good when you want to jump in and help save a character, or become their friend. I felt awful when Sarah was able to get some time to herself and her first thought is, “I’ll finally get a break from holding my pieces together”. She needed something. Unsure of what that something was. Then, one day she is driving downtown when she passes by a young woman named Josie with a child in a stroller, apparently homeless. Sarah pulled over to give her Oliver’s lunch box filled with his meal for school. Sarah was so drawn to help this girl and her child. Will saving this homeless girl somehow fix the hole in her heart? Or, would this whole thing be a bad idea? Who would be saving who, if she did help? Who is the person that needs shelter? Is it anyone in particular, or everyone? Anyone that reads my reviews knows that I do not like to give the story away…so, I will stop here, so that you can truly enjoy each turn of the page of this wonderfully crafted story.